It's been a minute since I've posted, and I've missed blogging. Traveling and getting back into the swing of things took me away for a while, but I'm back! My husband and I traveled to the west coast for a wedding and mini-vacation, and on our flight over to Vegas, I had the opportunity to read Lean In by Sheryl Sandberg. My girl Jackie, book lover extraordinaire, over at The Big Sea (Check out her blog!) recommended it to me and posted about it. This book is so timely for me, given my plans to re-enter the world of work after almost 5 years of being a full-time graduate student. 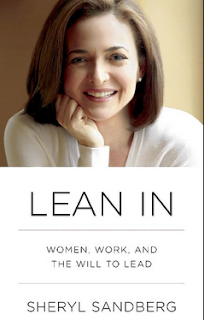 If you haven't heard of Lean In or haven't been watching TV for the past few weeks, this book is Sandberg's, who is the COO of Facebook, tome about how women can get ahead in the world of work and how the world of work can help to facilitate women getting ahead in the work force and claiming more leadership positions. She cites some great research and provides interesting statistics that are hard to refute. I'm telling you - almost every page has a quotable excerpt. Jackie and I were talking about how this book should be required reading for every girl who is an upperclassman in high school or who's attending college. Category 1: Audiences for whom the book is not applicable - If you are a woman who isn't interested in building a career outside the home or thriving in your current career, this ain't for you. Further, if you are not interested in supporting your female partner in getting what she wants and succeeding in the workplace, again, this ain't for you. Category 2: People who haven't read it - You can't fully critique something you haven't read. Watching a few snippets on TV doesn't count! While there are so many quotables and wonderful ideas, I'll just leave you with a few that are resonating with me most at the moment. (1) Our career paths should be more like navigating jungle gyms than climbing a ladder. Success doesn't always happen in a linear fashion. Sometimes you have to move laterally and possibly move down a rung or two to eventually get where you want to go. (2) Women's careers are just as important as their spouses, and women should treat them as such! I take this to mean that if women are bringing home some bacon, and they're in careers that are meaningful and fulfilling, they have every right to negotiate their about how their relationship/family dynamic can accommodate their career aspirations as well as their partners. I think so many women give up our career dreams and defer to our mates, and that's OUR faults - not our partners. I believe our partners want to see us happy, so we have to be more vocal about what we need in our home life and our careers. (3) Stop being so damn scared, girl!!! Ok, this is a big-time paraphrase, but that's what my inner voice kept telling me as I read. Sandberg discussed how women often talk themselves out of being ambitious and applying for jobs because they think they aren't qualified. Conversely, men (generally speaking) do the opposite - they jump out there even when they aren't necessarily good fits for positions. Sandberg encourages women to take the plunge and to jump out there and learn on the job. I mentioned earlier that reading this was timely. I had a really important interview yesterday. As a matter of fact, I was shocked when I got an email about interviewing. This morning, as I prepared to Skype into the interview, I thought, "Self, what would Sheryl do?" I commenced to getting myself together. I put my shoulders back, held my head high, and leaned in to that interview. I gave it my best. I tried to be confident and poised, and most of all, I interviewed like I was deserving of the position. No matter what the outcome, I'm proud of myself. I still have a few chapters to go, but I had to tell y'all about it. This book got all up in my spirit! Sheryl gets a "Werk!" from me. Has any one out there read it? Are you hesitant to read it? I'm open to hearing about other folks' perspectives on the book, so feel free to leave a comment. Until next time . . . get like Sheryl! Lean in! Thanks for posting on this book, Toya! I am going to purchase it now so I can read it next week. I think it is exactly what I need to read right now as I am approaching a critical nexus in both life and my career. I'll definitely come back with some discussion points once I'm done!